My new favourite vegetarian soup, this Zucchini Noodle Curry Coconut Soup with Grilled Tofu has deliciousness to the max, you guys! There’s a rich curry and coconut based broth seasoned with flavours of garlic and ginger and then there’s marinated grilled tofu with loads of veggies, including mushrooms, peppers and spinach. Plus, zucchini noodles – how fun! What’s up? How was your weekend? Did you celebrate St. Patrick’s Day this past Friday? Drink green beer? Wear a silly shirt ? Do tell! As usual, our weekend was food filled. The weather was decent this weekend (unlike last) so we decided to venture out on Saturday. We have this farmer’s market here, which is quite popular in the summertime. You can purchase locally grown veggies, lamb, eggs and even buy prepared meals. The smells wafting through the spot is amazing! This time of year there’s not much in the way of veggies for sale cause local farmer’s can basically only grow in the summer; our weather doesn’t allow growing year round. But, there were lots and lots of food vendors there, all the same – everything ranging from curry, brisket, cupcakes, charcuterie, pickles, spice mixes to extravagant grilled cheese sandwiches. Hubby and I opted to get this wicked good brisket sandwich. The sandwich was prepared right in front of us and there was a kosher pickle thrown in for good measure. With big smiles on our faces, we took our wrapped sandwiches as if it were the best thing ever and headed on. We grabbed a couple of coffees and the newspaper on the way home and we were set! I don’t know about you, but I LOVE a coffee with my sandwich. The two go together like peanut butter and jam, in my opinion. How about you? The farmer’s market is supposed to be moving to a larger facility which is going to be awesome because I can imagine that there’s going to be a lot more vendors there. It always amazes me when we go out and about how many talented people there are and, not only that, the wide variety of cuisines available in our little city. I think next time, I’m going for some curry; I really enjoy curry, especially when it’s extra spicy! Speaking of farmer’s markets and food and veggies, onto this Zucchini Noodle Curry Coconut Soup, shall we? I love this soup! It’s so easy to prepare and disappears in no time. How to Marinate Tofu? How to Grill Tofu? For the tofu, you really want to get some of that moisture out. I used, and recommend, firm tofu. Cut the block in half and wrap in brown paper towel. Lay on a plate and place something heavy on it, like a cast iron pan, to press some of the excess moisture out (you’re going to want to do that a couple of times, replacing the brown paper towel each time). Marinate in a simple mixture of soy sauce and sesame oil for about 10 minutes. Then, remove the tofu from the marinade and place on a griddle pan for about 5 minutes, turning once. Cut into cubes and that part is done. So easy, right? And check out those awesome grill marks below! Woot woot! #TheLittleThings. This curry coconut soup comes together quite quickly, so I would suggest having all your ingredients prepped in advance. It makes this move along smoothly and that way you can get this goodness in yo belly faster! Full fat coconut milk is recommended because it has such a rich, coconut-ey flavour. If you want to lighten things up a bit use light coconut milk or cut the full coconut milk with water (half coconut milk, half water). Curry powder was used in this soup, but curry paste can be used instead. I used the ‘hot variety’ but you could use regular if you prefer things less spicy. Speaking of spicy, I used 3/4 tsp of chili flakes. You could use more or less (or none at all) depending on how you like your food. This soup is quite relishing. There’s something about it that just hits the spot. It didn’t last long in our home. Hubby and I ate some right away and went back for more. The tofu adds a lovely substance and the coconut base is deadly good. And if you want to add a little somethin’ somethin’ to serve alongside, grilled naan would work wonderful. Dip that stuff in the broth and you are set for a train to flava town, my friends! Don’t forget a little squeeze of lime! It really brightens the dish up (lemon works wonderfully too). 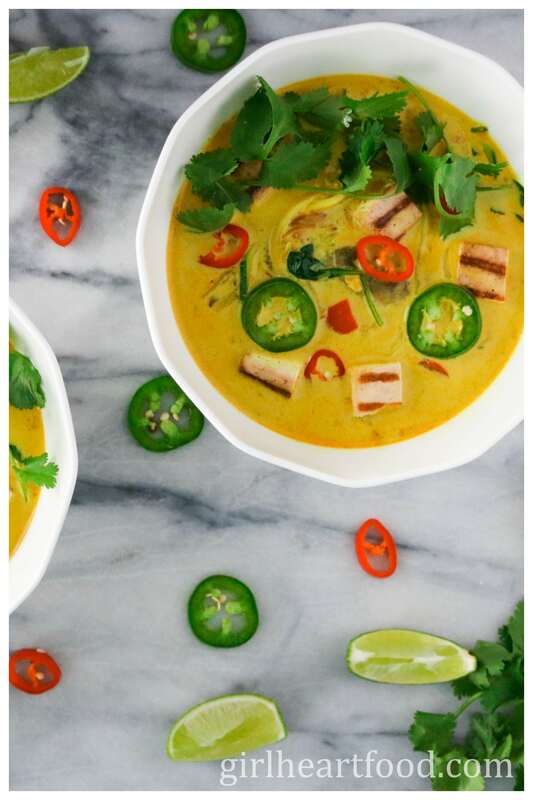 My new favourite vegetarian soup, this Zucchini Noodle Curry Coconut Soup with Grilled Tofu has deliciousness to the max, you guys! There's a rich curry and coconut based broth seasoned with flavours of garlic and ginger and then there's marinated grilled tofu with loads of veggies, including mushrooms, peppers and spinach. Plus, zucchini noodles - how fun! 2 zucchini -spiralized & cut to desired length. See below. Cut tofu in half and wrap in brown paper towel and place on a plate covered with a heavy pot to press some moisture out. Leave 5 minutes and repeat once more. Remove brown paper towel from tofu and discard. 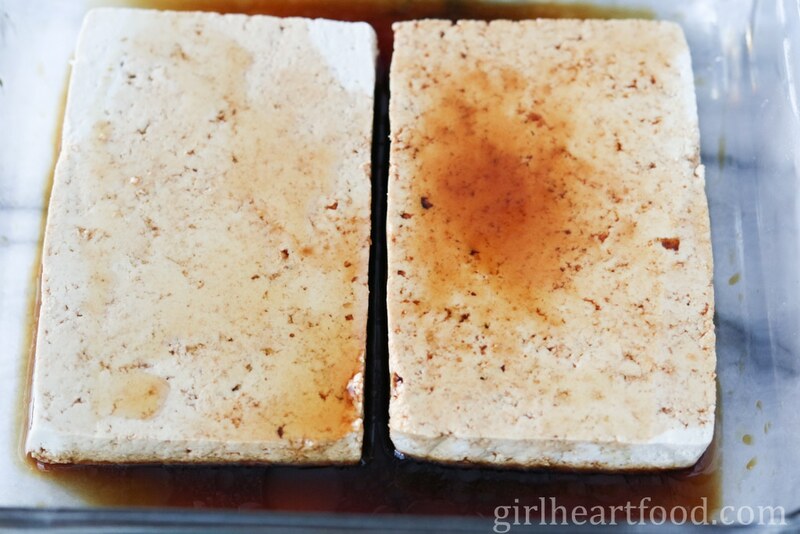 Combine soy sauce and sesame oil and pour over tofu in a shallow dish and leave 10 minutes. Remove tofu from soy sauce/sesame oil mixture and grill for 5 minutes on medium heat using a pan with grills (if you want the grill marks) turning once. Cut into small cubes and lay to one side for later. Reserve marinade. In a pot over medium low add coconut oil. Cook shallot until translucent, about 5 minutes. Add garlic, ginger, curry powder, chili flakes, salt and pepper and cook 1 minute. To mixture, add coconut milk, veggie stock, mushrooms, bell pepper and reserved marinade. Bring to low simmer and cook 5 minutes. Add zucchini and cook 2 minutes more. Add baby spinach and cook about 1 minute until just wilted. Portion into bowls and garnish as desired. Enjoy! -You can also substitute with another type of noodle if you wish. Soba noodles work lovely here too, for example. You know what’s weird? I LOVE tofu and never have I grilled it. WHY!? I have no idea. But this soup has be sold — it combines everything I love in one little (or big!) bowl. 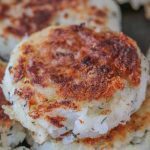 Great recipe Dawn — I just pinned it! Have a great weekend! Now is the time 😉 Grilling definitely adds to the flavour. A big bowl is necessary 🙂 Thanks for the kind words and Pin, Justine! My mouth is watering just looking at your soup ! It looks delicious ! There is something with curry and coconut, they just go so well together ! I love to walk around farmers market too, that’s my kind of shopping ! Thanks for sharing ! Thank you very much, Vicky!! I love coconut and curry too – could probably eat every day 🙂 Hope you have an awesome weekend! I love the combination of curry with coconut. This soup looks great! Good job with the grill marks on the tofu, too! I’m Pinning this recipe to try. I love curries!! This one looks so delicious! I am wondering what spiralizer you have? I have been meaning to get one, but I have no idea which one to buy! This recipe combines some amazing and nutritious ingredients. Thanks a bunch for the idea, Dawn! Gorgeous. Some of my favorite flavors in one bowl! Pretty photos. Thank you so much, Mimi 🙂 !! Yes! I love mine! Thanks so much, Kate 🙂 And appreciate the Pin!! I MADE CURRY FOR THE FIRST TIME EVER YESTERDAY!!!!!!! Awesome! Did ya like it? I make it allll the time and LOVE it spicy!